South East Oakville custom home on a private half acre lot. Airy, open concept floor plan offering 9,248 sqft of finished living space over three levels. A grand covered entry opens through double doors to the spacious foyer with two-storey ceiling and sightlines to an impressive gas fireplace with full-height stone surround. Luxury features throughout the home include natural stone tile and wide plank hardwood flooring, custom millwork, crown moulding, high-end window coverings and designer lighting fixtures. The foyer is flanked by the formal living room and an office with double French door walkout to a covered terrace. The dining room, with central chandelier inset a tray ceiling, features convenient servery access to the gourmet eat-in kitchen. Custom soft-close cabinetry with under-cabinet lighting accentuates the granite countertops. High-end appliances include a commercial-grade Wolf double oven, an integrated SubZero refrigerator, and a built-in Miele dishwasher. Panoramic windows surround the breakfast area, overlooking the rear yard and pool. A light-filled sitting room with two-storey ceiling and gas fireplace with contemporary waterfall feature overlooks a cozy family room with coffered ceiling and custom built-in entertainment centre. A traditional oak staircase with broadloom runner leads to the second level landing with gas fireplace, overlooking both the foyer and sitting rooms below. Another gas fireplace is located in the master bedroom, with dressing room and double French door walkout to a covered terrace overlooking the rear yard. The spa-like master ensuite features heated marble tile flooring, a Jacuzzi soaker tub, and a walk-in shower with body jets. The third, fourth, and fifth bedrooms also enjoy their own dedicated ensuites. 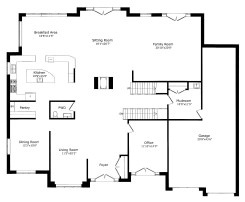 The highly functional floor plan offers a convenient second level laundry room, main level mudroom with inside access to a triple tandem garage, and a walk-up from the fully finished lower level, which features a nanny suite, a recreation room with gas fireplace, a theatre room with surround sound speakers and Epson projector, and a wet bar overlooking the temperature controlled wine cellar. Outdoors, dine al fresco on your covered flagstone patio overlooking the in-ground pool. Professional landscaping is serviced by a full irrigation system for minimal maintenance. An outstanding package combining a quality home on a premium lot in a desirable location!